Above you can see the view that I had from my roof at 6 a.m. yesterday morning. 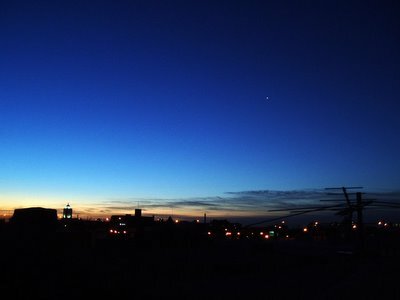 Venus, when sitting alone in a clear sky, is just entrancing, no doubt about it. And I'm also sure that photographs don't get the magic across. Photos are just rectangles, really. There is no substitute for actually going out and standing, sitting, or lying down beneath an all-encompassing sky. I've been doing too little of that in recent months, which is why I'm making a big deal of going out yesterday. And it was unbelievably cold, because of the wind. The highs in New York these days are just below freezing, but it's the wind that gets you. I blocked the wind by getting behind a chimney on the roof. I sat down, closed my hood, put away my gloved hands and waited another half hour for sunrise. My hope was to see the crescent moon, just about a day and a half away from new -- and no luck. Too many clouds on the horizon. I noticed that Jupiter, in the binoculars, was making a triangle with two star-like dots to its left. One was in the plane of the ecliptic ("pointing" to Venus from my perspective) and was sure to be one of the Galilean satellites. But below it was another dot, and that did not seem like it could be a moon of Jupiter. It had to be a star. It's just that I'd never seen such a lovely mini-conjunction in the sky. It was truly gorgeous. The star turned out to be SAO 159028, shining at 5.2 magnitude from 765 light-years away. Just above it, Ganymede was shining at 4.6 magnitude. The conjunctions with this star are still occurring and can be seen anytime that Jupiter is up. Later that night I visited my sister, nephew and niece in Dobbs Ferry, New York, about an hour north of the city. Leaving the light pollution of the five boroughs is always exciting, and I invited my sister's family to take a little lark with me just after sunset, on the Hudson River. Since the river was barely a minute away, we all went, and the sky was crystal clear -- but the winds were so strong that we stayed in the car almost the whole time, spying on the river with binoculars, and looking for Mercury. I could not locate it until we started driving away. Then we all got out briefly -- very briefly. 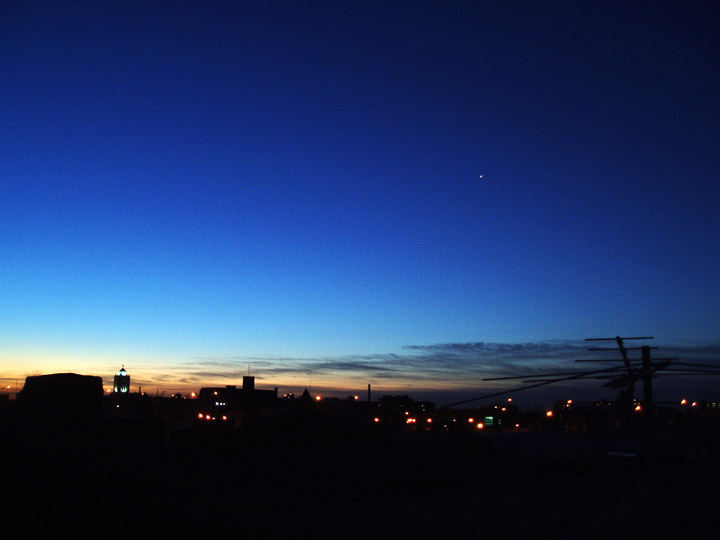 It was around 6:30 p.m., forty-five minutes or so after sunset. Everyone saw it with the naked eye, including 9-year-old Ian and 6-year-old Maddie. But we all shivered uncontrollably, and Ian was pushed around by the wind when he tried to steady himself with the binoculars. It was great to show Mercury to my family, since hardly anyone ever sees the planet -- but the night was not fit for observing. I don't even have a photo, because the bones in my hands could not stand being out in the air long enough to play with the camera settings. Riding home in the car with my father, I could see through the car window an object that I never see in the city without binoculars -- the "sword" in Orion, where M42 is located. It's a shame that cloudy days are warm, and that clear days are so cold, as if we were lying exposed under the cold of space and not just its stars. It may be just a rectangle, but it is beautiful.